Apple added several new companies to its Apple Maps Acknowledgements page over the course of the past month, possibly hinting at future plans for improvements to its mapping app. The Acknowledgements page lists all of the sources that provide information to Apple for the Maps app. New listings include GasBuddy/OpenStore and GreatSchools, two additions that AppleMapsMarketing speculates could lead to Maps upgrades like gas prices on gas station locations and school data for school locations. GasBuddy.com is a site that is designed to highlight local gas prices, helping users find the cheapest gas in any given area. GreatSchools.org is a community-based site that aggregates information about schools, including students enrolled, available programs, ratings, and academic test scores. Apple has also added Yext to the page, a site that allows businesses to update their locations for multiple online sites at one time, but the company's partnership with Yext was previously known. The National Land Survey of Finland Topographic Database is also new, likely adding new maps data for the country. Though Apple's acknowledgements page lists GasBuddy and GreatSchools, the above-mentioned data is not yet showing up in the Maps app, and it is unknown exactly when and if Apple will add gas price and school information to Maps. It's entirely possible that the company's partnerships with GasBuddy and GreatSchools have been established to bolster existing data on the locations of gas stations and schools. Since Maps' rocky debut in 2012, Apple has made continued efforts to improve the app by hiring mapping experts around the world, fixing user-reported errors, and boosting points of interest through its data partners. 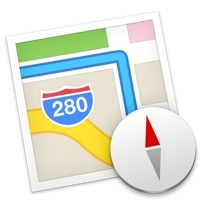 Most recently, Apple added 10 new data sources to Maps, sometime around November of 2014. Apple is rumored to be working on some major Maps improvements like transit directions and indoor mapping information, but the launch of these features seems to have been pushed back due to internal organizational issues. It is not known when Maps might see its next major update, but because there seems to be no sign of Maps upgrades in iOS 8.2 and iOS 8.3, it's possible Apple is saving the feature for iOS 9. Update: iDownloadBlog spoke with a GasBuddy representative and learned that GasBuddy is not supplying Apple with gas prices. Instead, the company is sharing station information like brand name and address. I've long thought Apple should buy GasBuddy and integrate it with Maps. "Hey Siri, where's the cheapest gas near here"
Fantastic, now I can drive 10 miles out of my way to save 47 cents on a tank of gas! Sorry, I guess I don't get GasBuddy. The stations near me are always within a few cents of each other. I get gas where it's convenient, not where it's cheapest. Gas Buddy is my savior. That and Waze. Nothing beats Waze. Sorry Apple & Google Maps. As a frequent maps user I can say the maps app has jumped tremendously in reliability over the last year. Google still beats them on POI and search functions, but other than that I pretty much use Apple maps daily now. Looking forward to the updates. This just underscores how slow Apple is with everything. I'm still amazed on people still trying to use Apple Maps. Siri is a complete waste of time such that I turned it off. I'm sorry ButterySCrolling, I am unable to find "Cheap Gas" near your position. Are you sure you didn't mean "Closest McDonalds"
Apple Maps usage has been rising for two years. It has always been more accurate for me (US city, with Flyover) than Google Maps. Google would regularly send me to a restaurant/etc. blocks away from the actual location. That's not enough for me to put up with Google Maps' failings. But I don't go around advising people to stay away from Google if it's what works for them. It's nice having two good options (and more). People have always had problems with Google map errors. Always will. Same with Apple, Waze, etc. But the media didn't tell us to pay attention to Google's errors. So we shrugged them off: not a perfect service, but still awesomely useful! But with an Apple logo on the SAME kinds of little errors, it was made out to be the end of the world :) People noticed when the media raised a constant hue and cry, and every Apple error they saw, they remembered and did not shrug off. I've given up on Apple maps, to be honest. Which is too bad because it's the only option on CarPlay. It's just misrouted me too many times, into too many dead ends and away from too many destinations. I'm glad to hear they keep improving it, but I think it's too late for me. Absolutely! How long were you asleep?